i’ve been busy, but i haven’t really made much. things have been pretty different, since neighbor baby came and Zander stopped napping. i’m still trying to figure out what i’ve done to deserve those two things happening in one week, and how i can make up for it, karmically. yeah, it’s a word now. i just decided. 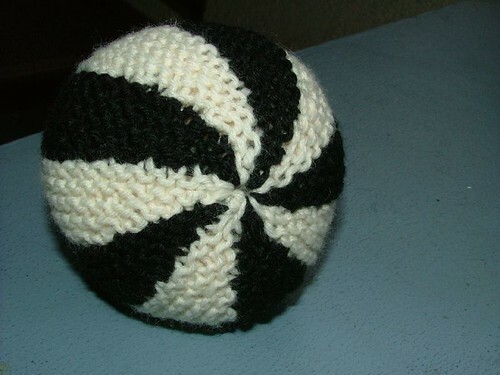 it’s a short rows ball, made in really nice 100% wool from austrailia. i didn’t have time to felt it, but i think it’s tight enough to keep the stuffing in- which, by the way, is the raw wool stuffing. first time i’ve used it, and it is far better than the poly junk. it was so nice to stick my hand in it to pull out a big hunk. i hope the little man loves it. some notions, an iron on tranfer pencil, and some thread, and a receipt that somehow read close to $95! it was one of those moments when you summon every fiber of your being to keep from screaming “i’m sorry, WHAT??! 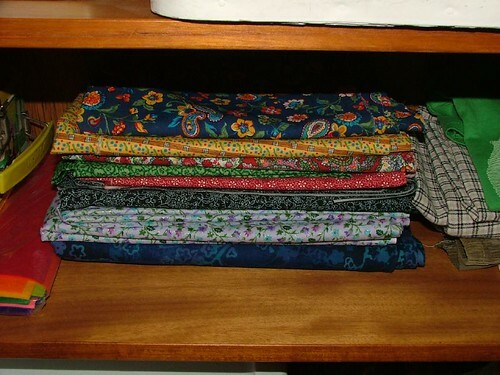 ?” at the cashier, who in this particular case was a very stern russian man of about 55 (he was pretty cool though- super generous when he cut my fabric). trembling, i handed him my credit card, wondering how i could make things out of this fabric that would feed my family for a week, as that’s about what i was spending. so far, i’ve got nada. i’m making many sketches, though, and you never know when inspiration will strike… c’mon… and… STRIKE! sage has already claimed the lavender for herself, so i’m working on a smock or pinafore type dress pattern- something that can go over a turtleneck and tights for the winter, and all alone in summer. oh! also! i went over to malice’s the other night to watch her tv show! it was hiiiiiii-larious. check it out, thursday night at 10:30 on the food network. our friend who played the pivotal role of introducing hubberson and i circa 1994 in his parent’s basement is the other star, or executive sous chef as duff has dubbed him. he is one of the funniest people i know- always delivering the deadpan line that makes you laugh till your belly hurts. love these guys- love them. watch it, so they make another season and my friends can be superstars. I am back from my weekend of fun and craziness with my team members, who by the way, loved their conference lanyard-y type flair. I feel almost re-adjusted to normal life, although I started sitting my neighbor’s 5 month old this week, which has thrown me for a teeny bit of a loop. I am compelled to write today about a cause that’s very important to the company I am fortunate to work with (can’t name the company, lest they become angry and take away my position, but if you’ve gotten email from me, you know who I’m talking about), and thus to me as well. Domestic violence affects so many people in this country- women and men, but most importantly, children. Feeling responsibility for these young lives is something those of us living peaceful lives in the home should take very seriously. While I can’t write about what my company is doing to help these young minds and hearts break the cycle of violence they are raised in, I am able to point those of us with crafty tendencies to a new charitable venture called Project Snuggle. You may have seen this on Whip-Up. 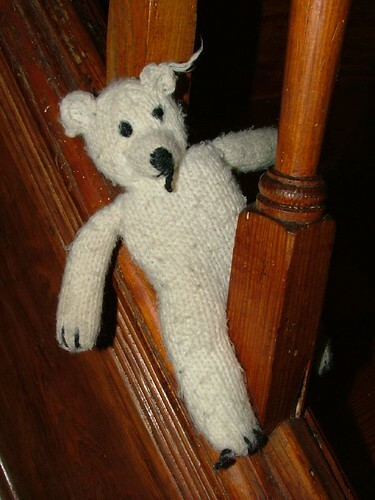 Basically, knit/crochet/sew/concoct a teddy bear, and send it to the organizer, fluttercrafts, in Phoenix. She’s connected with local police who will take a bear when they visit a home to investigate a domestic violence call. Go to the site and read the post- she’s even got some patterns if you need- and then get out your tools and start some bears! This was my special snuggly present for Sage when she was baptized- my mom said she needed something white to match her getup. Three years later, he’s still kickin’, although he’s showing the love he’s received, and he’s not really what you’d call white anymore. He’s been washed many, many, oh so many times. The pattern is from Knitting For Babies, Melanie Falick/ Kristin Nicholas. It’s easy and quick, and the resulting bear is super adorable. I can’t wait to try out my raw wool stuffing! paper boxes were big in my family growing up. my nana taught me how to make them (while she watched her “stories”) when I was still in elementary school, out of old Christmas cards. we’d center the most beautiful part of the design on the top of the box, then use the back of the card for the bottom. i used to love putting things in them to give to my friends, and just having them in little stacks in my bedroom. my mom and nana and I even folded a bunch of these for favors at my wedding! they’re also great to make for giving everyday little treats for your little ones- erasers, stickers, barrettes, anything that will fit in a small package. and, we all know the best things come in small packages, right? click on the tutorial link in the header, and let me know what you think! dear god, people, MAKE THIS LASAGNA. you can find the recipe here, and while you’re there, buy an affordable subscription to my favorite magazines: Light N’ Tasty and Simple and Delicious. they have easy, homestyle recipes submitted by real people all over the country (and canada? ), silly names, and, best of all, NO ADVERTISING! i have very little patience for ads ever since we got rid of our television- especially tv ads, which are so loud and fast-paced, they leave me feeling jittery and unsettled, but even print ads annoy me. back to the dish- it’s so good, and i’m a discerning part-sicilian, so i know a good lasagna when i bite into one. 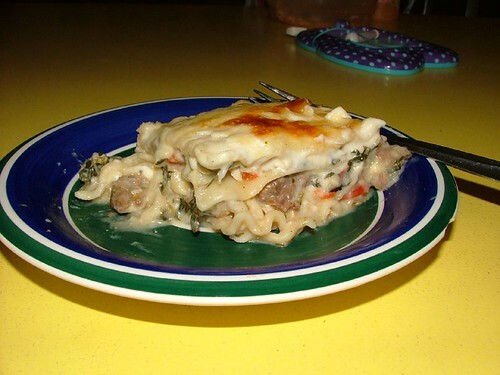 and man, did i ever bite into this one… i added more garlic (6 cloves), a little more spinach, and a bit more cottage cheese than was called for in the instructions. let me know how yours comes out! 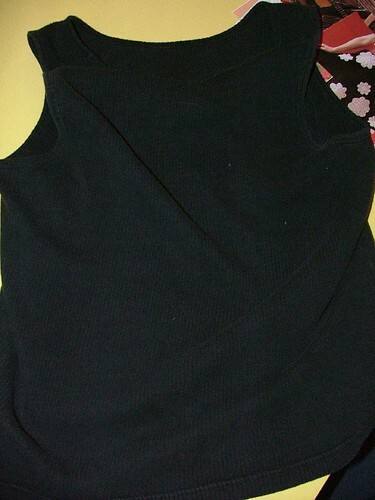 it was that one black tank top that you always wear, that’s soo comfy and fits perfectly. inevitably, that is the shirt that your baby spits up on, the one you splash oil on while cooking, the one your hubbers grabs first as a rag for his spilled fabric-eating chemical (mine didn’t do that, though, thank you GOD). you can’t really see the stains in the photo above, but take my word for it, they were there, taunting me when i went out in the sun from their rental property on my favorite summer shirt (and, the heat index today here in baltimore is 106 or something equally insane, so i really needed this tank back). i wanted to get rid of those little annoying and randomly scattered stains, but nothing seemed right. i originally wanted to just embroider over them, but this is a jersey knot top, and ribbed on top of that, not a candidate for embroidery. then, i got the new boden kids catalog. it’s chock-full of appliqued shirts for girls and boys. THEN, i read stephanie’s post showcasing these beauties (thanks for the tips, stephanie!). it was decided that i should applique over the stains. so, i spent the next week cutting and sketching and banging my head against the wall repeatedly, when finally it came to me- i could cut some smallish shapes that could be spread over the whole top, stitch-witchery their backs (that’s right, it’s now a verb), then machine stitch around the edges to keep them stable for washing. I didn’t have any heatable interfacing in my sewing box, and as we’re on a pretty tight budget here, i had to use what i had. but, it worked great! 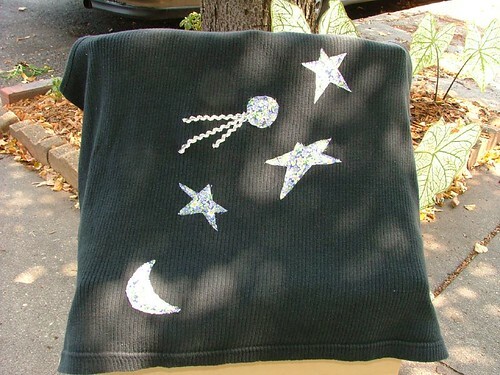 i haven’t washed it yet, but i’m hoping the edges will fray to the sew line- i think it would be cute that way. the comet was an afterthought- i found another stain after i had finished the moon and stars, and had that silvery rick rack out…comet tail? i went with it. the applique fabric came from a sweet little dress that my daughter had grown out of- i rescued it from the goodwill pile a few days ago, thankfully. it’s a purple and yellow floral. so, i think this should be entered in the embellishment category, but it has its roots in another garment, so it’s sort of a deconstruct/reconstruct, too. i used a black thread on top, and a white thread in the bobbin, to give the stitching kind of a salt-and-pepper kind of look. i feel like i’m still trying to figure out my machine, getting through the break-in period, but all in all, i’m pleased with how this came out- i’m definitely going to get a lot more use out of it now! 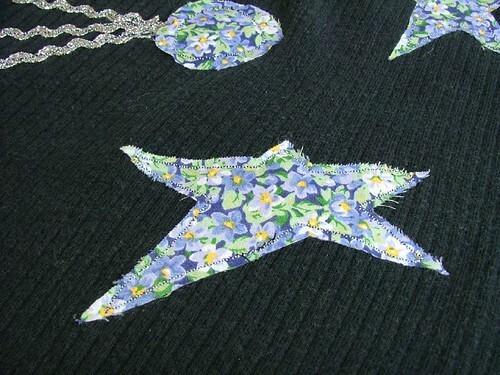 hmmm… what happens when i stain the applique?